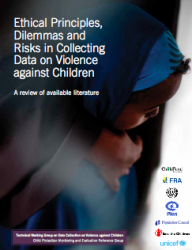 This is a report by the Technical Working Group on data collection on Violence against Children. Recent years have seen growing efforts to collect data on violence against children (VAC) but there are, as yet, no internationally recommended or agreed ethical guidelines for such research. This literature review aims to contribute to the development of such ethical guidelines. It aims to capture current thinking on ethical issues and providing empirical support to guide recommendations for ethical research practice and decision-making in collecting data on VAC.